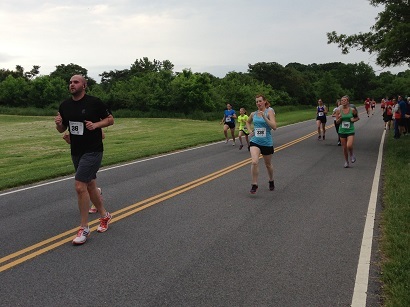 When the runners of the Semper Fi 5K lined up to the starting line Saturday at Anacostia Park, each had their own motivation for racing that day. For many, running the race was a way to support the mission of the Semper Fi Fund, a non-profit organization that raises funds for wounded Marines and Sailors as well as members of the Army, Air Force and Coast Guard who serve in support of Marine forces. For others, the race served as a source of motivation, camaraderie, or a goal to work towards following a period of adversity. Overall winner Justin Snair, 30, from Arlington, Va., who led the pack with a time of 15:39, chose the race to support the U.S. Marine Corps, and also because it presented a good opportunity to close out his strong spring training season. A former Marine himself (though, as indicated by their slogan Semper Fi, always faithful, there are no “former” Marines), Snair found the race to be fast and flat, with a talented field but not overwhelmingly crowded. Third place overall finisher Travis Boltjes, a pilot in the U.S. Air Force and a consistent presence on the local 5K race circuit, found the Semper Fi 5k to be extremely well organized, and in part due to the flat, fast course and great weather, performed his best so far this year with a 16:44 finish. Local runner Elizabeth Rappaport, winner in the 45-49 age group in 24:12, chose to run the race as her first 5K after beginning to train with a local running coach, Mike Hamberger, three months ago. While a seasoned trail runner, Rappaport had never tried track workouts before, but found that with her coach’s help and regular training sessions, she is getting in shape and avoiding injuries for the first time in recent memory. For other participants in the race, it was a way to start back on the road to recovery after getting through personal challenges. Tony Cook, an Air Force Veteran from Alexandria, Va., suffered from severe asthma since childhood, until the point of being bedridden, on oxygen, and unable to work just three years ago. Following an operation known as Bronchial Thermoplasty, Cook has a renewed lease on life. Finishing the race in 24:45, his goal now is to keep getting back in shape and leave his days of wheezing far behind. For Marine Corporal (Ret.) and disabled veteran Darrin Snyder, who now competes in the hand cycle division after blowing out both knees during his Marine days, the race represented one of just many he does for fun with his wife Jackie and service dog Remy. In all, representatives from the U.S. Marine Corps, Army, Navy, Air Force, and Coast Guard completed the race. The Semper Fi Fund was created in 2005 and has raised more than $73 million and assisted more than 9,200 Service Members since its inception. More than 900 participants and volunteers came out on Armed Forces Day (May 18) to support the Semper Fi 5K, and the race raised more than $44,000 for the Fund.